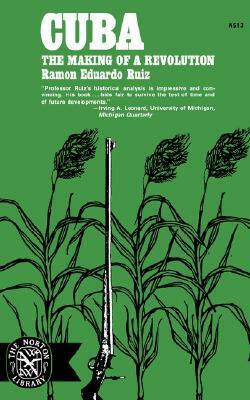 Cuba: the Making of a Revolution by Ramon Eduardo Ruiz was nothing like what I expected. I thought I would get a concise history of Fidel Castro's 1959 revolution; instead, I got the context that led to the revolution, and that context revealed something to me that was totally unexpected: the supreme idiocy of US Foreign Policy. As far back as the late 1880s the US was busy doing what they do so well today, enslaving other countries' economies to their own, manipulating those countries' politics, keeping those countries poor and dependent and generally sewing anti-Americanism everywhere they went. I had a sense that they have always done this, but I had know idea how little the methods have changed. The immense naivete of US thinkers is staggering. The US made the revolution of 1959. They are responsible for communism in their own hemisphere just as they are responsible for Noriega and Hussein and the Taliban et al. I was always more than a little frightened that the US was the only country that had used an atomic bomb and that they maintain a massive stock pile. After reading this book and absorbing the reality of US stupidity in the wide world of national relationships, I am fully terrified for everyone's future. But I'll get over it next week when the Russians win Euro 2008. Hmm. Well the author does provide some insight i have not seen before. But the bottom line seems to be that it's all our fault. It's the U.S.'s intrusion on others' affairs, contradicting the strong Cuban nationalism, that was the impetus. While I do believe the U.S. intrudes, I don't know that it is such a major factor in what occurred in Cuba. There were numerous leaders, some, but not all promoted by the U.S., who led the people to be discontented and welcoming of a revolution. Whoops. This is supposed to be a review of the book, not the theory. This author, Ramon Eduardo Ruiz is well known and well respected as an authority on Cuban history, so I will accept his thesis, and say the book is interesting. Mr. Ruiz clearly states that the Cuban Communistic Revolution against Diaz was inevitable. The roots for revolution are found in the people's fight against the island's identity as a 'plantation-style' world. It is hateful and unnatural for people to live as such. Unfortunately, the current Communist state is another plntation-like world for the Cubans. teh author lays this out with much eoloquence and history. i enjoyed this historical/sociological study of Communist Cuba. An o.k. overview of the events leading up to the 1959 revolution, especially if you find this book at the Friends of The Seattle Public Library Used Book Sale April 11-13 for 50 cents. A nice book that traces the roots of Castro's revolution and the relationship between Cuba and the united States over the years.